This is the fourth post in the series of Android Application Development articles. To read the previous post, click here. Numbers don’t lie, and that’s why boring pie-charts, histograms, and tables (no offense to business analysts and data scientists) still hold an important place in the company boardrooms. If numbers are so important, why not to consider them before taking the plunge in entrepreneurship or appreneurship, which is probably a more suitable term to signify mobile app as a viable business. Here’s the five stats that you must check if you are planning to or have already ventured into appreneurship. 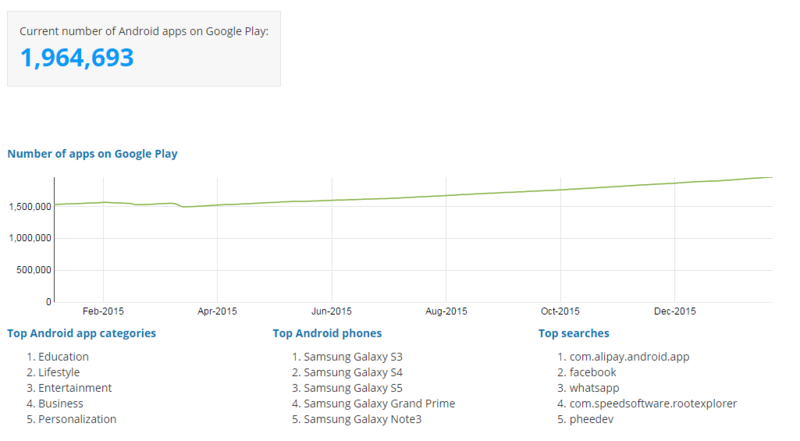 There are more than 1.9 million apps on Google Play Store, and it is fast approaching the 2 million mark. The chart shows that the number of apps was close to 1.5 million at the start of the year 2015, and in the span of one year, it has grown by more than 30%. The competition is huge, and it is only going to increase in the foreseeable future, so the right time to develop an Android app is now. Note: All 5 top spots of Android Smartphone are taken by Samsung. Make sure your app is responsive for screens of both smartphone and phablet. Education category has the highest number of applications followed by the categories Lifestyle, Entertainment, and Business. 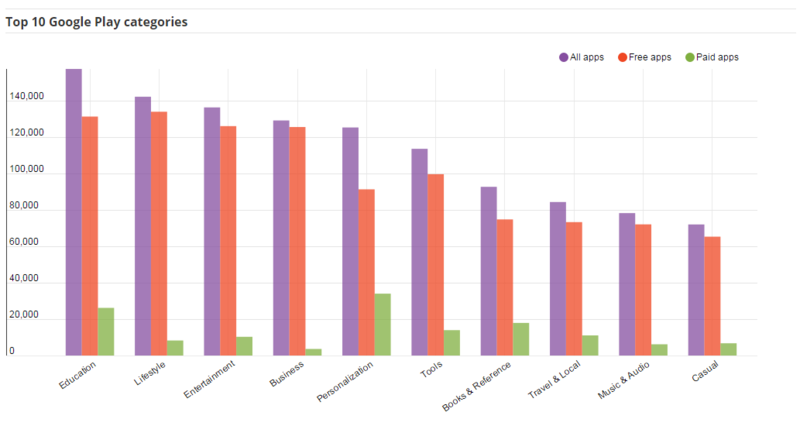 The number of paid apps is highest for apps in personalization category. In nearly each category the number of free apps is 10x more than the number of paid ones. 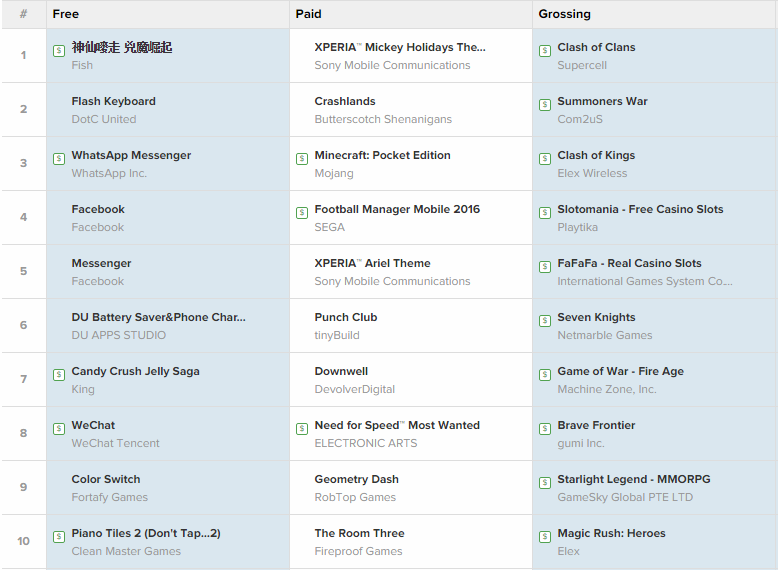 These are the top applications till January, 2016, in the U.S. Social and chat applications are popular in free app category, while Games are a popular choice in the paid category. Naturally, the list of top-grossing has many popular game titles. 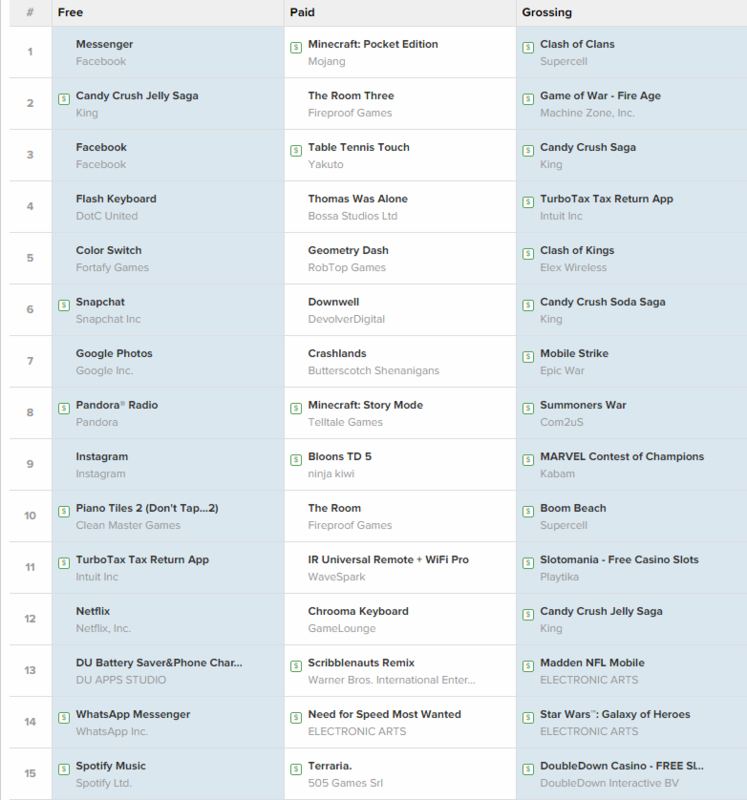 All top-grossing apps have in-app monetization model. The apps with less than 2.5 average rating have only 16% of apps that are downloaded more than 5000 times. On the other hand, 43% of applications with 4.0-4.5 star rating have been downloaded more than 5,000 times. The reason why we are seeing contradicting figure for those apps that have been rated more than 4.5 stars could be “the number of total ratings” for those apps. 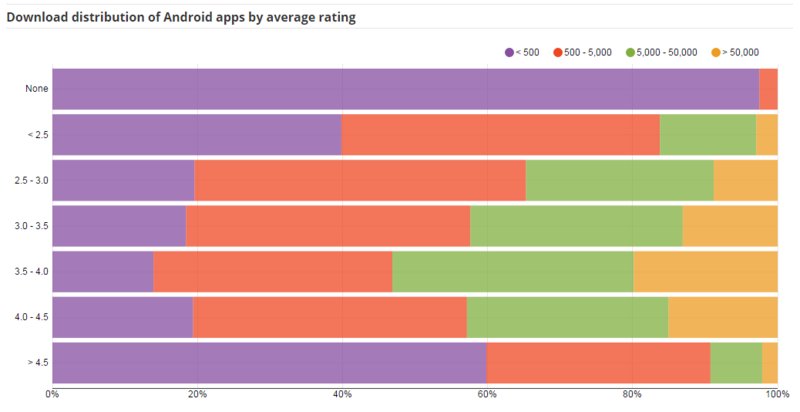 There are thousands of apps on Google Play Store that have high but very few ratings. Users interpret these ratings as those given by friends and family and hence, don’t really believe the app to be of high-quality. These are some new and important stats that you must consider if you’re somehow related to Android App Development space. There are some useful insights that can be drawn from these numbers. Next Week we have a pretty interesting and important topic to cover i.e. How To Engage Users With Your Android App. A lot of good stuff is coming. Stay Tuned! The Battle of Virtual Reality: Who’s The Winner? Not Happy With Your Website Design? This is What You Should Do!